The Grand Circuit rolls through the first weekend of October with gusto and ends at The Red Mile for another autumn with the Kentucky Futurity on Sunday, Oct. 7. We will be covering that event, and the filly version, at the Breeders Crown Countdown blog. For glamour-boy trotters it presents itself as quite a contest. For one, it is a race with heats and a final on the same day. For two, Market Share, king of the division thus far, is not eligible (see below for his Saturday appearance in Kentucky). Friday and Saturday at The Red Mile will be covered in this blog, as will two main frosh features at Maywood Park on Oct. 5. Friday, the International Stallion Stakes (INSS) offer nearly $600,000 in purses for freshmen, most coming back from last week’s Bluegrass Stakes. The INSS events begin featuring two sharp fillies off of wins at Lexington. Nikki Beach scored for trainer Tony Alagna. Homer Hochstetler’s Ritascape had a tougher trip to win her division. But we will go again with Miss Madi M. She was very sharp getting third last week at 26-1 and any improvement puts her in upset mode. 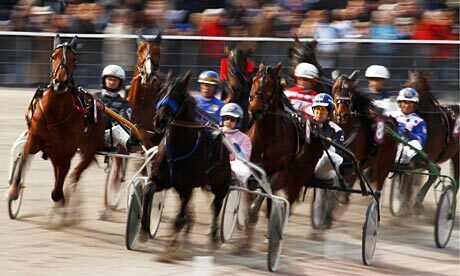 I Luv The Nitelife returns in the second filly pace and it will take some guts to support an upset this week. Trainer Chris Ryder has her sharp right now and all we can do is lightly support Want Answers again, putting mild trust in her finishing third last week against similar at 11-1. 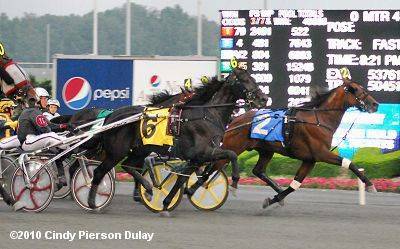 What some think could be most competitive division filly split pits Novascotia Hanover against Wherethegirlsare, South Pacific and Canary Island, a quartet of Somebeachsomewhere products. Going against these leaves only Hit The Curb, whose earnings are in the trio’s ballpark. Trotting colts go their second week in Lexington in four divisions. In the first split, Caveat Emptor may be overlooked. Last week’s choice in this group had a tough, wide start and was short. With post 8 and some foes on his inside that beat him, this could be the best moment to get value on a winning performance. Fashion Blizzard has the same type of trip that tripped up “Emptor” and will be gunning for a wire-to-wire win here. With the public going to him and Punxsutawney, the third-choice bargain could turn out to be Broadway Prince. Pine Credit is the morning-line favorite but we like the chances of outsider Lauderdale, the Jonas Czernyson student that has greatly improved since breaking in the Kindergarten. He may change his maiden status here by getting the top and staying there. Finally, don’t be afraid of the big price probably offered by San Donato in the nightcap for colt trotters. His jump last out may turn a lot of players off but a clean-gaited race with John Campbell up wins this as he did the Kindergarten on Sept. 13. Frosh-filly pacers battle on the Chicago front in The Violet Final and young colts are featured in The Cardinal Final on Oct. 5. Last week’s arrival to the half-mile Maywood from the mile Balmoral produced a win in a Violet elim for Special Rose and in the final she needs to be considered against the obvious giant favorites on her inside. One of those, Thank You Doc, was beaten by “Rose” and there is no reason to feel tonight will alter that result, especially since Rose should again be greater odds than her chances against the aforementioned. The Cardinal Final’s frosh colts also come off some sharp elims and here we need to take a shot with the outside horse, Fancy Creek Elusiv. A decent price is guaranteed because so many players will go for Fox Valley Action, who was second last week even after breaking at the start. However, “Elusiv” beat him the time before when conditions were equal. So, price plus performance can equal a good overlay play. Saturday, Oct. 6’s Grand Circuit card at The Red Mile finds soph pacers vying for over $1.1 million, including the $510,300 Tattersalls Pace, which drew a dozen of the sharpest from the tough colt division. Last week’s winner,Thinking Out Loud, who found a race he could win after so many disappointing appearances after winning The North America Cap, is back with John Campbell to negotiate post 11 in the second tier of the thick Tattersalls field. In a better spot, the 12 hole, is A Rocknroll Dance, who can gain instant position from the second tier and make one bold move, as in the Meadowlands Pace, and win this at a price his followers have earned over the last few events. Last week the supplemented Mel Mara was a longshot winner in one group of Bluegrass colts. There is still pointless buzz for Bolt The Duer and Sweet Lou has his followers but A Rocknroll Dance can be played here as an overlay while colts he has beaten for the best money get too much attention. The soph-pacing fillies compete in two $111,000 divisions of the Glen Garnsey Memorial, seven in each. Romantic Moment will dominate the wagering in the first split, though she lost to ended Shelliscape last week (that one is in split two). She can be beaten again, this time by Big Mcdeal, who was stoutly on the move last week and looks to be able to turn over a bigger mile here. Shelliscape will again have something to pace after in the second division, as she tries to close on speedy fractions. 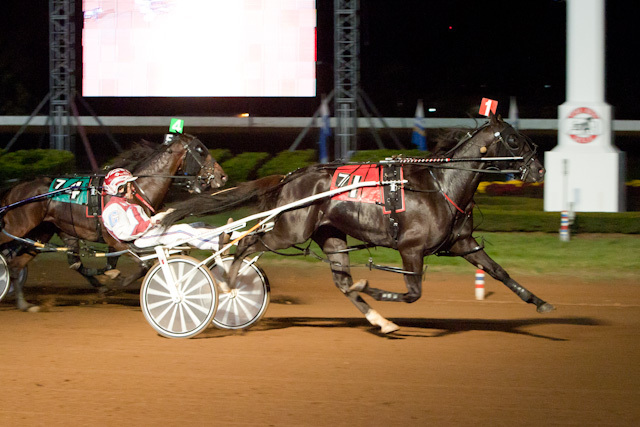 However, American Jewel loves the Red Mile and returned to top form here last week and could be worth it if the wagers will be spread out between the aforementioned, Darena Hanover (who won the Jugette) and always dangerous Economy Terror. The INSS for freshman colt pacers offers four full divisions for a total purse of nearly $350,000. Former Bluegrass winners, Rockin Amadeus, Fool Me Once and Twilight Bomber, line up to kick things off in round one. Fool Me Once should come right back and win. Odds On Equuleus was disqualified last week and is out for revenge but Our Dragon King is in a good spot to beat him without the luck of a dismissal. Captaintreacherous is back for trainer Tony Alagna and who wants to wager against him as he borrows his way to the Breeders Crown against the types he has beaten six of seven times in his initial season on the track. The crowd will look strongly at Apprentice Hanover but we will go again with Sir Richard Z Tam because he may be the best bargain between the aforementioned and the rugged but usually over-wagered Johny Rock. Post for Satuday is 1:00 p.m.